School year is well underway but school lunches don't have to suffer just because they are in a lunch box now! And they don't have to be untasty either! With two great organic products, Nocciolata and Fiordifrutta, kids can say “ciao!” to the ordinary PB&J sandwich and enjoy a delicious sandwich with organic ingredients that are free of GMO's, preservatives, colors, additives, or artificial sweeteners. One of the very most delicious things I have ever tasted is Nocciolata (pronounced no-cho-lata), an organic, better-for-you, high-quality chocolate-hazelnut spread. Nocciolata combines hazelnuts, cocoa and cocoa butter, natural vanilla extract, raw cane sugar, and skimmed milk for a chocolate-hazelnut spread with undeniably superior flavor and smooth, creamy texture. It's actually quite simple. Quality ingredients produce superior taste. Only certified organic ingredients go into each jar of creamy, dreamy Nocciolata. That means no chemicals, no artificial flavors, no GMOs and absolutely zero palm oil. Nocciolata is still made following the Rigoni's exclusive family recipe. It is a slow process that uses only carefully selected ingredients like dark chocolate from the Antillean Islands, Italian hazelnuts (16%), brown sugar, skim milk and Bourbon vanilla extract. Enjoy Nocciolata any time of day. Try it in the morning on toast, or on a crusty bread for a delicious afternoon snack. Nocciolata is the perfect special ingredient for cakes, crepes, cookies, muffins, and many more recipes. It's fantastic as a frosting or filling in all your baking inventions! No matter how you enjoy it, there are always new ways to love Nocciolata! The minute I opened this jar, I could tell it was different than any other hazelnut spread I have seen or tasted before! And it was! It was the sweetest, most delicious treat I have ever had! And I love that it is organic!!! I immediately looked up all kinds of recipes I can use it in and my son has really enjoyed it in his school lunches! And for the other half of his sandwich, he is also loving Fiordifrutta! Fiordifrutta simply contains over three pounds of perfectly ripened fruit, organic apple juice, and natural fruit pectin. Fiordifrutta Organic Fruit Spread is organic, non-GMO, Kosher certified, and gluten free. We are loving the Strawberry and Wild Berries flavors! The Fiordifrutta Organic Fruit Spread Strawberry is red, meaty, sweet and pleasing to the eye. Use as a classic topping for breakfast, in pies and cakes. Also sublime with fresh cheese. The Fiordifrutta Organic Fruit Spread Wild Berries is a cocktail of exciting flavors ranging from the harsh to sweet. The taste is something unique and unmistakable. A great choice on roast game or mature cheeses. A mix of blackberries, blueberries, cranberries, raspberries, red currants, black currants, rose hips and strawberries, this spread has all the properties of the individual fruits in a beautifully balanced mix. Mix up the tastes in your child's lunch box without sacrificing health or flavor with Nocciolata + Fiordifrutta! 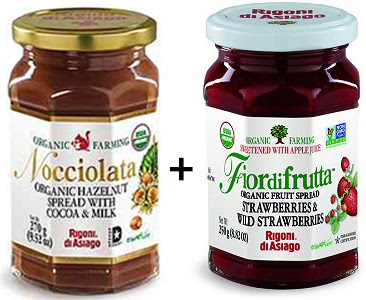 Rigoni di Asiogo is generously offering (1) jar of Nocciolata and TWO jars of Fiordifrutta to a lucky winner! I entered Jar of Nocciolata and 2) Jars of Fiordifrutta Giveaway. I entered Soothing Body Wash from Noodle & Boo Giveaway.